Eyeconic Melon Lemonade is orange to apricot in color with a red ring in the center of the flower turning to a purple color. Recommended for the Western States because of its susceptiblity to black spot. 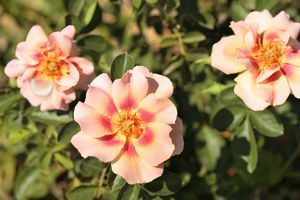 The Eyeconic roses are from the Hulthemia class of roses and appreciated for the distinctive red blotch in the center of the flower.